Blog > Travel mode: On! This is our friend Lynda (aka LyndaC). She’s originally from Canada  but travels abroad often and loves sending postcards from her trips, both to her friends back home and to others through Postcrossing. Sadly, it can be a bit awkward to send a postcard from somewhere exotic only to notice when it is registered that all the maps, statistics or flags of that postcard are wrong… so she used to refrain from requesting addresses in Postcrossing while traveling. To make life easier for the many postcrossers that travel every year and want to send Postcrossing postcards from their trips, we’ve introduced a new feature called Travel Mode! With your account in Travel Mode set to your travel destination, you’ll be able to send postcards while in that location with a local Postcard ID (if abroad) and correct maps, statistics and flags that reflect the postcard’s actual origin. While you’re busy exploring and writing postcards in Travel Mode, your account will be automatically set to inactive (since you’re not home to receive your postcards), but don’t worry — you’ll be sent all your due postcards as soon as you set it back to Active upon your return. So the next time you travel somewhere, just switch your account to Travel Mode, find some local postcards and stamps, and you’ll be ready to share some nice memories from your trip! We’ve added a FAQ item about the new Travel Mode, but if you still have questions, feel free to ask below. This is such a great feature. I am curious, when in travel mode, do you "count" as a Postcrosser in the country you are traveling in? For example, I have more than 1000 cards sent and am traveling to Peru. If I go into "Travel Mode" while I am there, will I be listed as the top Peruvian Postcrosser, or is only people whose home base is in a country who appear on the list? @ColorfulCourtney Your travel destination is not made public anywhere... so I'm afraid you won't be showing up on Peru's rankings. That sounds like a great new feature! I will definitely try it out on my next trip! Yay! I'm happy to see this feature! I sent postcards from France earlier this year but was concerned about whether I should really be doing that or not though people seemed happy with the surprise! I'll make sure to utilize this on my next trip! 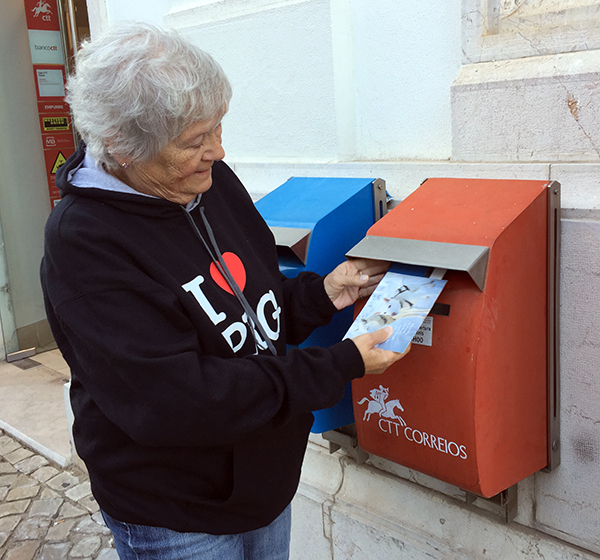 This is a great feature for expats who travel back and forth between their home country (postcrossing speaking) and their country of origin. I’ll certainly try it out when spending the yearend holidays with my family. Thank you very much for implementing this! Great ! What a wonderful idea ! I will use that new feature as soon as possible i.e. this next March from Indonesia instead from France ! Cool ! Great news for all active travelers! Really nice also to send/receive from special countries! Such as the Aland Islands, African countries etcetera! Awesome!! I'm so happy to see this new feature! I am glad that you've introduced this. Sending postcards to near and dear ones when on a holiday has been a long-established tradition. I am sure many postcrossers will gain from this. @Honeysong We'd recommend setting your account inactive some weeks in advance, so that postcards stop being sent to you. You can keep sending them while inactive, if you'd like. This is perfect for me!! Can't wait to use it during my next travels! I'm glad to see Lynda helping the site by using her trips abroad to send postcards! Thank you!!! I'm very excited about this! I travel to rare (for Postcrossing) countries for work and always send cards. People are excited to receive cards from Ethiopia, Mozambique, and Bangladesh, but sad when they register them as US-###. Is there a way to go back and re-class old postcards? Also, for US Postcrossers, USPS now has a service that emails scans of your mail (envelope/back of postcard only). So, it is possible to register cards while away. How do you make sure that this new feature is not abused? In the FAQ you write: "If you're traveling abroad, the Postcard IDs will also be from your travel country — but you'll need to physically be in that country in order to request addresses, so that we can check that your location is a match." But how will you check that people are really where they pretend to be? I already see my mailbox flooded with cards from Germany, but exotic postcard ID. Ooooooooooooh, what a GREAT idea!!! This shoul'dve been available when I travelled to Armenia :-))) I sent a lot of postcards from there to private contacts, and I would've loved to send official pc cards with an Armenian ID. Thank you for introducing this feature! As an avid traveller, this is a feature that I will certainly use often !!! Thanks for this great initiative. This sounds wonderful - I will definitely use this when I am abroad next time. I always felt awkward to send a card not from my country and a different stamp with an Irish ID. Nah... we mostly look at the IP addresses. Truth is, there's always ways to cheat and people willing to go around the rules in place... but this is nothing new. As always, if you see something weird on the site, just get in touch and we'll have a look! Given that PXers from rare countries also like to travel, I reckon it's a good bet that if I ever receive a card from a Peruvian Postcrosser it will have an ID of the USA !! Oh, and I received an official from LyndaC! (from Canada). Hello! Hello Lynda!!! So fun to see you on the blog! Thanks for sharing and have fun traveling....see you in the C2C Facebook group!! I am surprised but I've never thought about all of this! I'm happy to get cards from other countries no matter what the postcard ID! In reverse, I don't like it when postcrossers from another country send me a picture postcard of some city in my own country! This happens occasionally and there is no way to prevent it. I prefer a card from where you are at the time it is sent. I'm so happy about this! Thank you!!! I know PostCrossers were happy to receive my cards when I traveled to Cambodia but I'm sure they were a little sad they couldn't officially add Cambodia to their country list on the website. Yay! Thank you for this great feature!!! And this feature will solve a big problem in PC : Cards from small countries such as islands in Caribbean can be found again. I'm looking forward to sending someone a postcard from Oman. February. This is a such a great feature . Is there a way to change the postcards already sent from vacation? As a little statistics geek: do the travel-mode-IDs count as regular-IDs for the respective country? If so, next vacation-season we may see some countries' output increasing fast with help by their postcrossing-tourist-friends. Now I have to think if I will use this for my trips aboard. But obviously, it's an interesting option for some users. @mousytrap Just make the Chinese characters reeeally big on your screen and try drawing them. It's not as hard as it seems, and the result will look like when children draw letters... but it's actually super legible and no problem at all to read. @minizdiary I'm afraid not. Only postcards sent from here onwards will have the right data. @Stevvy Yes, they do! So for instance, if you send postcards from Peru, Peru's total number of sent postcards will increase. No plans for travel statistics at the moment though. 1) You know in Europe are a lot of countries and when I'm on a trip, I may visit several countries. Now the question, is there any problem to switch the country from one foreign country, which is not my home country to another foreign country in cose fo being in travel mode?. 2) I'm not sending postcard inside my own country (which is germany), how does this work in the travel mode, do I get addresses from my home country (germany), do I get addresses where I'm actrually staying (travel country)? @linos203 1) You can keep updating your travel destinations as you move from one country to another – no problem! As long as you have access to a local internet connection in your travel places, things should work fine. 2) Essentially, we consider your country to be where your address is. So it all stays the same: if you've chosen not to send postcards to your own country, you won't get addresses in Germany while traveling (and vice-versa). An exception: traveling members won't be given addresses in the country where they're staying while in Travel Mode (for privacy reasons and to keep things simple). interesting. That make the chance to get postcard from rare county will be increase. And sure make me want to travel to another country. Makes a lot of sense. Thanks for constantly improve this lovely service you offer, guys! As someone who cannot travel I am happy to get cards from places I have never seen with the ID of that place on. I do get cards now from people not of their country but with their own ID on but I don’t mind as I get to see somewhere different. This is better as I get a new ID to add to my country list. This is great! I will try it in January, when I travel to Malta. A very useful feature, thank you. I look forward to trying it out on my next trip. Maybe some day it would be possible to have both 'sending address' and 'receiving address' which will make inactive mode unnecessary. What a great new feature! Thank you! I recently mailed Lynda a postcard! How great to see her! That's what make this community a great place, you are always improving and making it better! Thanks for the new feature!! I have a lot of postcards from my travels when I was younger. Unfortunately I do not send them because they are from other countries other than my own and a lot of people do not like them. Can I use this feature? Send previously bought postcards to postcrossers from the countries I have visited and have them registered in that country? I’m an expat currently living in Prague. I expect to be here for the next year or longer (I’m teaching English). I’d like to start sending again, partly because I’d like to use the postcards as part of my lessons but also because I just love getting postcards. Is it better for me to use Travel Mode or simply change my address and country? @csusy I'm afraid not... not unless you visit those places again. In order to use the Travel Mode, you need to physically be in the country which you set as your travel destination. @ilini I'm afraid once addresses are requested, we can't change their data. I was just in Morocco at the post office and wondering if it would be possible to do this. Thanks for reading my mind Postcrossing - a great feature I'm looking forward to using in Ireland next month! That this wasn't possible before was the one thing that always made me a bit sad on Postcrossing. I didn't expected you to ever implement a solution to this, so this is a huge surprise. Thank you!!! Just a quick heads up. On the new FAQ page there's a link that's supposed to go to the Account Settings but it's wrong and leads nowhere. It should be https://www.postcrossing.com/edit/account (instead of /settings). Great feature!! Last year I went to New Zealand, and most of my postcards did get there. However trying to figure out which street mailbox (international) to use was confusing, and people weren't helpful. And I didn't know how much postage to use either! I sent many postcards to friends not through Postcrossing, and they never got them. I think I used too much postage! When I got home to the States, I later heard that their postal service is not very good. So it was a miracle that most of my postcards through Postcrossing got to places! @Bellatrix Fixed! 😅 Thank you for the heads up. I did this recently when I was in Morocco and I sent out cards. It worked great and I received a notice yesterday that one card has been received. Brilliant idea, truly genius! Now we'll see a lot more cards from small exotic countries coming through. So great! @Eva_tls We believe all postcards deserve to be enjoyed in their intended recipient's hands — so we'd prefer to send them to you only when you have time to enjoy them. Definitely the best way to send mail through Postcrossing now! I love it. I mean, I always wanted to send something through Postcrossing as well, but it did not make any sense, since it did not measure any real distances! Thank you! I'm just about to try out this new feature now . . . . . . . . This is awesome! I wish I had had it over the summer, during my internship. I would have sent postcards then! I guess this also means that the sender's home country is still the one being relevant when the system decides where to send this card to, does it? So a travel card from "rare" Peru that comes from a German postcrosser would still go to someone who's supposed to receive a card from Germany next? Well, I've just called up my first address while on travel mode and GB-952663 is going to a German address. It's also the first time I've uploaded a picture of a postcard using Google Photoscan and I believe it has worked very well. I'm now looking forward to having the postcard registered. I love this new feature, cannot wait to use it! I was always wondering if something like this is possible, as I travel a lot. My last trip was to an 'exotic' postcrossing country Montenegro, would have been nice if I could have used it already ;) next time for sure! I love it! Will certainly try next time I am on my way. @Bellatrix I think I understand your question, but this is not how Postcrossing works. There are no pre-determined lists of countries you're supposed to exchange postcards with. It's mostly just random! Great feature and it works very smoothly ! Sounds great! I'll give it a go next week! Well done! We are going to visit Thailand so we will test it soon. @Nannika You can — travel is travel, whether it's for work or for fun. But please note the Travel Mode will only work if you can use a local internet connection to request addresses from the countries you're in. Give it a go though, and let us know how it works! Wow. Great feature. Now I look forward to seeing more cards from more exotic places. Unfortunately, that means I will be having more travel-envy! Amazing feature! Thank you to the Postcrossing team always improving the experience! Great! When i traveled to fr.guyane i wanted to switch my country but that would be a Big trouble :-) ......great solution this new feature ! Cool. I'm in India for 2 months next year. How many cards will one be able to send while in travel mode? Such a great idea! Thank you so much! I'm working abroad for two months and can now continue with Postcrossing while away. I'm so excited! What a wonderful idea! I will try it out next month when we will be travelling. I too love this idea! Thanks! What a great idea! Thanks a lot!! It's so nice idea! I'm traveling now and I have already tried travel mode. I wish everything go well:) Thanks!! I like this idea. I have the question if the German Post will do the Stiftung Lesen Project this year again. And another question is if the people visiting Germany during December are able to participate in the project too. So far I did not find anything about it. It's great for me too : I live in Switzerland, but only a few minutes away from the french border. People are often disappointed when I send them a french view, even if it's so much nearer to my home than Zermatt ! I'll give it a try right now. I think this is a great idea. One question- If I travel WITHIN my country, will the map change? For instance, I live in Virginia on the US east coast. If I travel to California on the west coast, I will still get a US ID, but will the map be different? thanks. What a fantastic idea! I ❤ it! Thank You for this! 2 summers ago I was spending time in Faroes and I felt bad that while I was able to send postcrossing cards with Faroese stamps and images they didn't count toward folks statistics as being from there. Also it brought down the travel time for postcards from Newfoundland because, crazy enough, cards get EVERYWHERE faster from Faroes than they do my Newfoundland and Labrador! I just tried this out on my trip to Toronto. I sent about 12 postcards from there, so it will be fun to see them reach their destinations. Fab idea, can't wait to try it! I don´t like it. You write as an individual registered in one country only. I wrote postcards from countries like Zambia, Kyrgysztan and many more with German ID. You can always add a charming text. The card is stamped abroad, so it is a card from that specific country. Why care about the ID! And the cards I receive at home are registered by my wife. oh cool! it will be easier for me since I'm study abroad and will only be back once a month. time to find more postcards! Travelling by sea between Scotland and Northern Ireland recently I changed my location from Arbroath to Belfast. I tried to send some postcards but could not call up an address because the Postcrossing system thought I was in Norway 😪. I wonder if that is where Stena Line is registered and could this be the reason? Wow, this sounds so cool! I wish I was going someplace as I love to send official cards even from my holidays.! What an excellent idea! Whoever thought of it, and whoever programmed it should be VERY proud of themselves and deserve a big THANK YOU! I have tried the Travel Mode while in Japan. Finally I can send Japanese postcards in Japan (and enjoy Japan Postal Office in the process). Travel mode motivates me to visit the postal offices of the countries I travel with my family and send postcards from there. I tried it out on a recent trip to Lisbon, Portugal. On the last day, I managed to send 4 cards after using my hotel wifi. Then the taxi to the airport arrived. Because our taxi lady was awesome we saved time, and the Lisbon airport has a postal office, so I figured I'd log on to the airport wifi and send some more cards. My location was displayed as 'unknown', so I couldn't - not sure what happened?